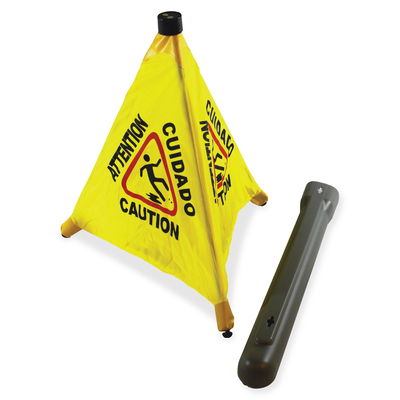 Pop-Up Safety Cone Lets You Quickly Secure Areas Needing To Be Marked Off. Triangular Design Features The Universal Caution Symbol And Trilingual Message On Each Of The Three Sides To Ensure Easy Readability. Plastic Tube Allows Multiple Mounting Options For Easy Access. Safety Cone Is Designed To Fit The Propack Bucketless Mop Handle (Sold Separately)..
Pop-Up Safety Cone Lets You Quickly Secure Areas Needing To Be Marked Off. Triangular Design Features The Universal Caution Symbol And Trilingual Message On Each Of The Three Sides To Ensure Easy Readability. Plastic Tube Allows Multiple Mounting Options For Easy Access. Safety Cone Is Designed To Fit The Propack Bucketless Mop Handle (Sold Separately).